* Wash Instruction: Machine wash or Hand wash in cold water, No Bleach, Low iron and tumble dry on low heat. * As different computer monitor display colors differently, thanks for your understanding. * Any questions please feel free to contact us directly. Vintage chic slanted zipper closure, two way of dressing hoodies tops. 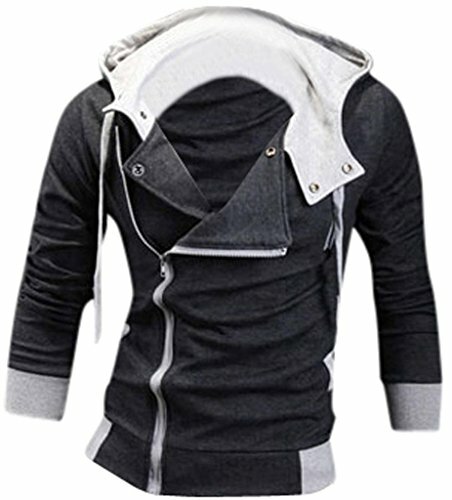 Lapel Drawstring Long Sleeves Slim Fit Hooded Jacket Coat Costume. Occasion: Slim Fit Hoodies For Casual Activities. Such as Club, Party, Hiphop dance, Play, Photographic, Sport, Movies and etc. Wash Instruction: Machine wash or Hand wash in cold water. If you have any questions about this product by jeansian, contact us by completing and submitting the form below. If you are looking for a specif part number, please include it with your message.